“Pink cherry blossoms”, “cranes”, “gold thread” and “Gosho-guruma” patterns on the green base. “Kakeshita (the kimono to be worn under ‘uchikake’)” is orange colored “shibori (tie-dyed fabric)” with embroideries of auspicious treasure motives. 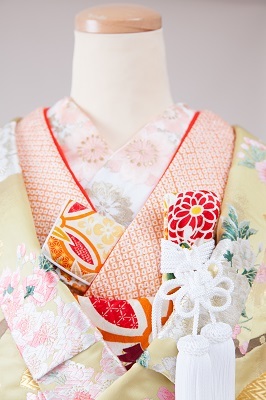 Flower embroidered collars and a dragger with retro design case and matching “hakoseko (ornamental pocket book)”. It has passed “Risshun (the first day of Spring)” , so it is already Spring on the calendar. At LST, we are proposing some Kimono styles in light colors with Spring feeling. This “Iro-uchikake” is designed by Yumi KATSURA. Normally, a white “Kakeshita” is worn with “Iro-uchikake”, but we found it’s more interesting. 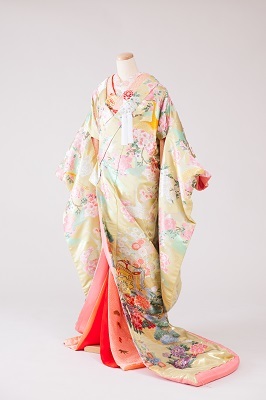 We will keep proposing our original kimono coordination so that you can enjoy more to wear kimono.